18 Wheeler Attorney in Texas | The Voss Law Firm, P.C. Have you noticed all the 18 wheelers on the road in the past several years? It seems like there are more trucks on the road then ever before, and more truck accidents as well. Relaxed regulations, laws such as NAFTA and a drive for high profits cause some trucking companies to cut corners on maintenance and repairs. While most truck drivers are extremely professional and responsible, that same drive for greater profits often causes some drivers to drive longer, farther and sometimes more recklessly then they should, just to shave a few minutes off of their time. Such behavior can cause a serious truck accident, and if it does, you need an experienced and well qualified attorney on your side. If you’ve ever been in an accident, especially with an 18 wheeler, you know there is a lot to worry about after the crash. Is everyone okay? Are the police coming? Is your car drivable? Do you need an ambulance? The first and most important thing to worry about is the health and safety of those involved in the crash and the other drivers on the road. Take care of your injuries, first and foremost. But what about hours later or the next day? An 18 wheeler accident is a complex situation, and you have many legal rights and responsibilities. 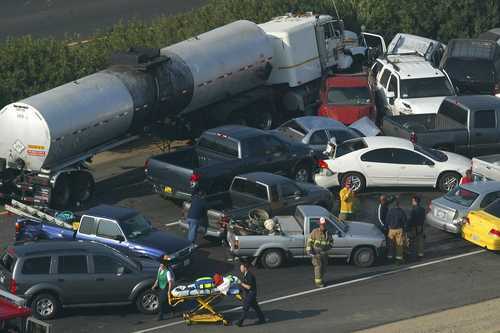 This is where an experienced 18 wheeler accident attorney like Bill Voss and The Voss Law Firm, P.C. can help. Dealing with a trucking insurance company can be a nightmare. Too often it seems like they think their job is to deny a car accident claim, not to pay it. You need a strong yet approachable advocate on your side. Only when the trucking company knows you are taking your claim seriously enough to get an experienced attorney on your side will they start respecting you and your rights. How many 18 wheeler accident lawyers in this country will actually pick up the phone and talk to their clients when they call and have a question? Not very many. Bill Voss will, and he takes pride in treating his clients like family.